Alpine Cinquefoil Potentilla neumanniana ?Nana? Formerly Potentilla verna ?Nana? or Potentilla tabernaemontani ?Nana?) 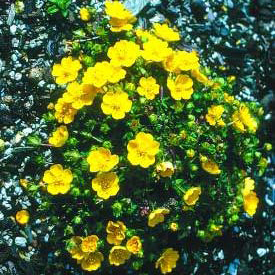 Alpine Cinquefoil is a delightful little carpeting plant, nice for growing between flagstones or in the rock garden. Single yellow buttercup flowers nestle among the small evergreen leaves in late spring. Very little maintenance is required. Easily divided in spring or early fall by digging up the clump and ripping apart into smaller pieces. Plants sometimes rebloom in early autumn. Requires good drainage. Evergreen in mild winter regions. A rock garden classic.